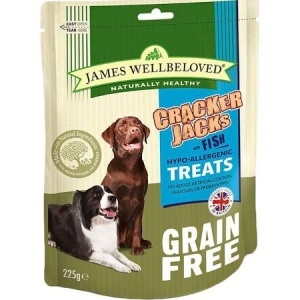 James Wellbeloved fish treats for dogs. With a handful of ingredients from nature, one source of animal protein and all the vitamins and minerals your dog needs. 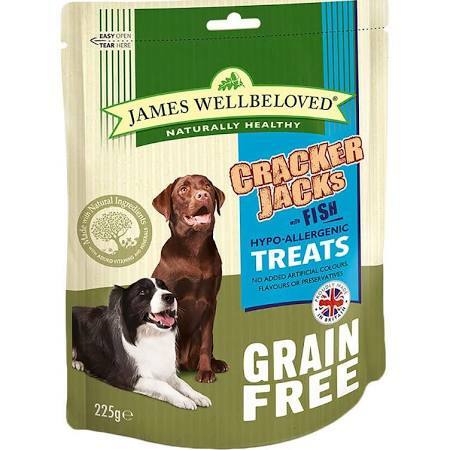 Naturally hypoallergenic so less likely to cause an adverse food reaction and no added artificial colours, flavours or preservatives. Ingredients: potato flakes (48.6%), fish meal (13%), pea starch (13%), tomato pomace (11.5%), olive oil, lamb fat (2.5%), peas (2.5%), mixed herbs, carrots, potassium chloride, sodium chloride, calcium carbonate.